Gutters that frequently clog or are damaged can lead to serious problems, including roof and foundation leaks. 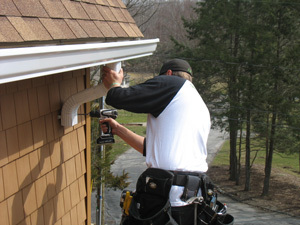 At Complete Home Solutions, we provide expert gutter installation and repair services, including gutter guards. We can help you get the right solutions to keep your home fully protected from water damage! If you're interested in new gutters for your home, give us a call today at 1-855-247-9984 or click below to get started! We offer free estimates on all our gutter services in Annapolis, Glen Burnie, Pasadena and the surrounding areas. Materials: Modern gutters are typically made from aluminum, as aluminum gutters offer a great combination of affordability, durability, and design choice. These are often used on historical or unique homes. 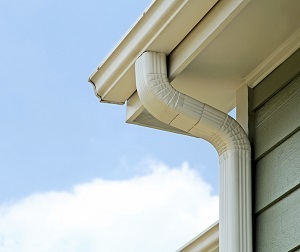 If you're interested in a gutter replacement or gutter installation for your home, the experts at Complete Home Solutions are here to help. Our experienced professionals will help you determine the right gutter services and materials for your needs and provide you with a quality repair or installation. Call us today at 1-855-247-9984 or contact us online to get started on your gutter project. We offer free estimates on all our work in Annapolis, Glen Burnie, Pasadena, Rockville, Annapolis, Bowie, Bethesda, Upper Marlboro, Waldorf, Laurel and throughout the surrounding areas.